Dreaming about a European Vacation? How about Eureka Springs, AR. Once his apprenticeship there concluded, Chef Dave packed up his recipes and knives and moved to the United States. In fact, he moved into a quaint little town that compliments his European culinary training perfectly. This town, nestled into the Ozark Mountains, is known as Eureka Springs, Arkansas. It is here that Dave creates “fluent” culinary conversations of delicate crab and tomato remoulade…sea scallops and lobster butter sauce…and many other fine nouns with adjectives to die for. Eureka Springs is impossible to describe…it has to be experienced. I can’t do that for you here but I can tell you from my own experience…as soon as you arrive you begin to rethink your life and you begin to make plans to either visit often or just pick up and relocate. Its natural springs, small winding streets, and historic quality is reminiscent of a European village and the food is AMAZING. 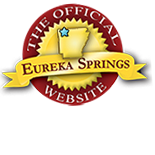 If you have dreamed about taking a European vacation but the time and price involved make it just a dream…consider visiting Eureka Springs, Arkansas. Stroll the narrow streets, get to know the place and meet Chef Dave. You can find him at The Grand Taverne. This entry was posted on March 30, 2011 by estcblog in Culinary Adventures, Fun Downtown.